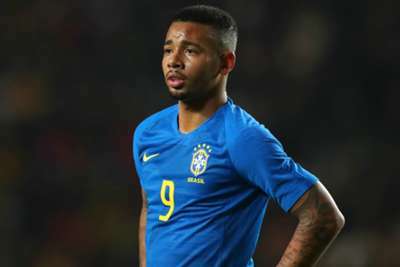 Gabriel Jesus said post-World Cup was the most difficult moment of his career, while the Manchester City and Brazil striker insisted his stagnated form is normal. Jesus endured a rough Russia 2018, with the City star criticised after not scoring a goal throughout the tournament as Brazil lost in the quarter-finals. Ahead of Brazil's international friendlies against Panama on Saturday and the Czech Republic three days later, Jesus discussed his World Cup woes. "It weighs nothing on me today, but it was very difficult to assimilate," Jesus told reporters. "My family and friends have helped a lot. "I do not live this moment today because of my poor form, but because of the great phase of [City team-mate Sergio] Aguero. "When I play I help the team. In the post-Cup I still thought a lot, it was my most difficult moment as a player. But I overcame it, I worked, I conquered my space again. That shook me only at the beginning of the season, has not shaken for a long time." Jesus hit the ground running at Premier League giants City following his arrival from Palmeiras in 2017 – scoring seven goals in 10 league appearances. The 21-year-old backed that up with 13 Premier League goals in 29 games as City won the title last season, though he has managed only six goals in 23 for the champions this term. "I've talked a lot with my family and my friends. I had a very good time in my career and life, I came and got things very fast," Jesus said. "Today I think I had a break and I think it's normal. "I'm 21, I do not have to rush things. Today I live a phase that I'm a reserve and seeking ownership in my club. I'm looking for a space against a guy who is the club's top scorer, Aguero, who has helped a lot. "I'm working day by day and trying to recover my space. I had an injury two weeks ago and I was 10 days off. And now coming back, I'm trying to recover, it's a decisive phase, I want to help my team to win the title."